As of today, the details pane bottom function is broken on my laptop. I guess it was set to hidden, to unhide I pressed Alt+shift+P and saw that it moved to it's W10 default position to the right. In OldNewExplorer 1.1.8.2 it was still checked for bottom. I unchecked and checked the option, and reinstalled OldNewExplorer but none of it seems to work. The other styling options however dó work. Running Windows 10 Pro 1607, with Clover 3.3.4 for Explorer, which always worked fine with OldNewExplorer. I had a Clover update a week ago, but that worked fine so I don't think Clover has anything to do with it. Edit: it came back. I didn't do anything, the window was open the whole time while I was in Chrome typing this comment and googling around. After I switched back the details pane was at the bottom again. As of today, the details pane bottom function is broken on my laptop. I guess it was set to hidden, to unhide I pressed Alt+shift+P and saw that it moved to it's W10 default position to the right. In OldNewExplorer 1.1.8.2 it was still checked for bottom. I unchecked and checked the option, and reinstalled OldNewExplorer but none of it seems to work. The other styling options however dó work. Running Windows 10 Pro 1607, with Clover 3.3.4 for Explorer, which always worked fine with OldNewExplorer. I had a Clover update a week ago, but that worked fine so I don't think Clover has anything to do with it. It works for me on Creators Update stable. I only had to reset the size because after the update it reverted back to small, but it works. I was using Windows Ultimate Tweaker 4.2.3 and realised that some of the options disabled the ability for Windows 10 to find update for MS products and generally messed up windows update. I hit restore defaults and rebooted. Since doing that OldNewExplorer doesn't work at all. Nothing I do makes any changes anymore which is annoying because I was relying on it to make my theme nice and minimal. 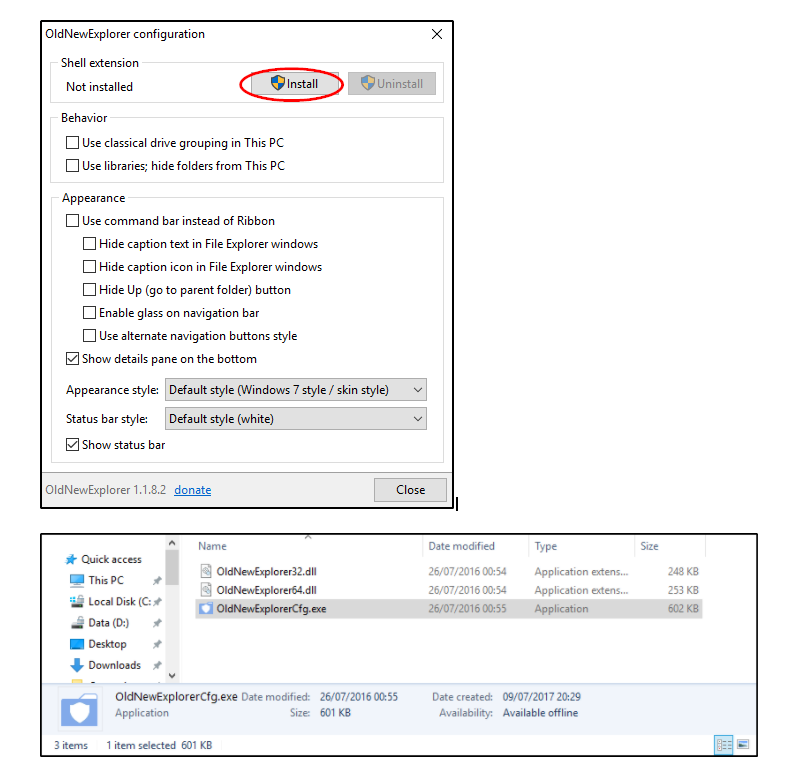 Anyone know why restoring defaults on windows ultimate tweaker would disable the use of oldnewexplorer? Hm... didn't realize this program came from here. So... in windows 10, problem is, when the PC has been on for a while the details pane randomly disappears from the initial explorer instance. I can get it to appear again by creating a new explorer instance - either explicitly launching windows in a new instance or just restarting the initial one(though sometimes that has other undesirable side effects). But hey, that's advanced power-usery stuff and who has time for that. Would appreciate a fix. ONE is NOT working at all on new Insider Build 16193. Using ONE version 1.1.8.2, I cannot get the details pane to be displayed on the bottom as of Windows 10 Pro, Version 1703, OS Build 15063.296. I'm not sure what to do. Hopefully there's a fix, and if anybody knows, please tell me! Where are the arguments? I've tried it recently and I've to say that from the perspective of applying visuals styles WindowBlinds has became much more stable than it was a couple of years ago. I haven't noticed too much of system slow down either. Any love you can lend to ONE to get it working (details pane) with the Win 10 Creators Update would be SO MUCH appreciated! Many of us are happy to make donations if that would help. The developer doesn't care anyway, this software is pretty much discontinued. Shame that we're not seeing a new version. 1.1.8.2 kinda works but I'm experiencing the same trouble as the posts quoted below... and I really like the feature to use 'classic drive grouping'. Anyone know of an alternative to oldnewexplorer? 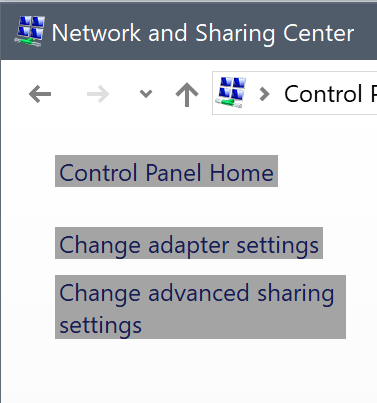 On windows 10 version 1703 there are some problems in control panel pages that have links in sidebar. I'm using this program more than a year since version 1.1.7 on windows 10 enterprise x64 and since the first day I have an annoying problem. And that is the details pane suddenly disappears until I restart explorer.exe from task manager. Even the most recent version (1.1.8.2) didn't fix the issue and it happens again. also after disappearing details pane, the hard drive grouping titles disappear too and just the numbers remain.